Monte Verde is divided into two parts: Monteverde Vecchio and Monteverde Nuovo. 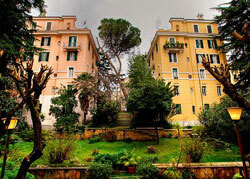 Monteverde Vecchio is located between Trastevere and the Vatican. Housing in the quiet green area of Monteverde Vecchio consists mainly of three- or four-story apartment blocks. It has a large middle-class population. Villa Pamphili, one of Rome's largest parks, is located here. It is difficult to get from Monteverde Vecchio to the historic centre, though, due to a lack of public transportation. Buses to Trastevere and the Centro Storico are easier to get in Monteverde Nuovo. Built during the 1950s, Monteverde Nuovo is not that attractive an area, but it is an inexpensive place to stay.